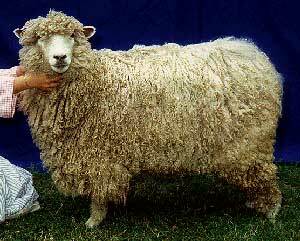 The Leicester Longwool is a sheep breed with a long and interesting history. The fleece is heavy, curly, soft handling and lustrous, with a spiral-tipped staple 200-250mm in length, 32-38 micron. The fleece generally weighs from 11 to 15 pounds with some weighing as much as 20 pounds. Leicester Longwool are generally described as a medium to large breed with a large, high quality carcass. They are currently found in the US, Great Britain, Australia and New Zealand. The breed was developed in the 1700's by Robert Bakewell. Bakewell was the first to utilize modern animal breeding techniques in the selection of livestock. 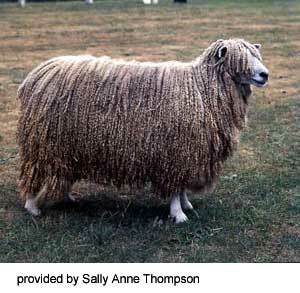 Using these practices he developed the Leicester Longwool from the old Leicester sheep. His selection techniques changed a coarsely boned, slow growing Leicester into an animal that put on weight more rapidly and produced less waste when slaughtered. Robert Bakewell deserves recognition for his work with these sheep because it changed livestock farming forever and because it influenced the work of people such as Charles Darwin and Gregor Mendel. Since wealthy colonial farms often subscribed to these journals to keep up with the advances of the day, news of Bakewell's endeavors reached the thirteen colonies as well. George Washington was so interested in Bakewell's ideas that he made reference to him in several letters. In 1793 Washington wrote "...and the choice of good rams from the English [Leicester] breed which we now and then get over notwithstanding your prohibitory laws or customs." In 1837 the agriculturalist Youatt wrote "within little more than half a century the New Leicester had spread themselves over every part of the United Kingdom and to Europe and America." 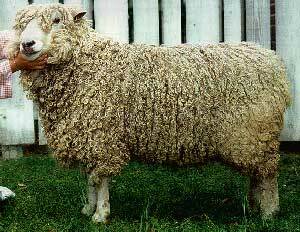 The Leicester Longwool were well known in the colonies and were used in the 19th and early 20th centuries created new breeds of sheep. They had almost disappeared from North America by the 1980's. In the early 1980's Colonial Williamsburg's Coach Livestock Department began a search for a breed of sheep that fit their 18th century mission. They began the search for an authentic breed of the 18th century by using primary documents of the time. Unfortunately, very few breed names appear in those papers, and the only Williamsburg reference is to a "lost Guernsey bull." Sheep, however, often appear on area inventories and wealthy farmers apparently subscribed to English farming publications to keep in touch with the latest practices and ideas. Eighteenth century farming literature was full of praise and accolades for a breed of sheep referred to by several names including "New Leicester, Bakewell Leicester, Dishley Leicester," and "Leicester Longwool." These were the sheep developed by Robert Bakewell on his farm called Dishley in Leicestershire, England. The following is an excert from an article about the Leicester Longwool which appeared in the July-August, 1995 American Livestock Breeds Conservancy News. The article was written by Elaine Shirley of Colonial Williamburg's Coach & Livestock Department. The Leicester Longwool seemed like the perfect breed of sheep for Colonial Williamsburg, especially with its ties to the first farmer! We immediately began searching for Leicester Longwool sheep but regrettably came up empty-handed. Many people suggested we use Border Leicester sheep (a breed developed from Leicester Longwools) but no one could help us find the breed of sheep we were looking for. At this time we received an announcement of an animal auction at Woods Edge Wools in New Jersey. On the sales list was an English Leicester ram lamb from a small Canadian flock. Because of previous false leads we were hopeful but apprehensive. To our delight this ram turned out to be the real thing so we purchased him and soon began our search for Leicester ewes. Our attempts to obtain ewes from the same Canadian flock were fruitless. The result was that we used Willoughby on our Dorset ewes untiI more suitable matches could be found. Willoughby produced some beautiful crossbred lambs, whose fleeces were long and fine. For two years we slowly raised funds and continued to search for Leicester ewes. The Colonial Williamsburg Leicester sheep project took a great leap forward because of an unexpected tragedy. For some reason, still unknown today, someone brutally killed Willoughby in 1988. His "obituary" appeared in the Colonial Williamsburg Magazine and we were amazed at the response. Sometimes a tragic event can focus efforts toward a greater end. People from all over the country wrote to us expressing their sorrow and dismay over his death. Many sent donations for the purchase of more Leicester Longwool sheep! We received donations from philanthropic foundations as well as small gifts from young children. Through this outpouring of kindness and generous donations Colonial Williamsburg was able to realize its goal of importing purebred sheep from Australia. We were fortunate to be in contact with Ivan Heazlewood from Tasmania. Ivan is a third generation Leicester breeder and had at this time just started research on the Leicester Longwool's contribution to Australian sheep farming. He personally took on the considerable task of organizing a flock of sheep for importation to Colonial Williamsburg. He selected ewes from four different flocks and arranged to have the ewes bred to rams that remained behind in Tasmania. He also selected a ram for us to use the following year. We were very happy to receive several ewes from Ivan's own Meltonvale flock. The sheep finally cleared all the standard health inspections in Australia and arrived in Canada for quarantine and the final portion of their trip. After many long and anxious months eight beautiful Leicester Longwool ewes, six lambs and one ram arrived at Colonial Williamsburg in February of 1990. Jeanne Asplundh began her Pennsylvania flock with two sheep from the original importation. The more I learn about the history of the Leicester Longwool the more impressed I am about their value to humans. They were not only instrumental in the colonization of New Zealand and Australia but their use in the 19th and early 20th centuries created new breeds of sheep and affected almost every existing British breed of sheep. The Leicester Longwool's use at Colonial Williamsburg is broad and varied. Their presence allows us to talk of the age of enlightenment as it pertains to agriculture, we can show George Washington in the role he enjoyed best, and we can discuss the tremendous importance the wool trade had on the history of Great Britain. Perhaps one of the lesser known contributing factors of the revolutionary war were the wool trade restrictions put on the colonies. Colonial Williamsburg could easily display any breed of sheep and most people would not know the difference. Our mission as an educational institution, however, makes it important that we be as historically accurate as possible. This applies not only to the clothing styles worn and household furniture displayed but to the livestock raised as well. The future of the Leicester Longwool in the United States and at Colonial Williamsburg looks bright. We have had a great deal of interest in breeding animals, satellite flocks and wool sales. Their success will rest with the handspinning community and this group of shepherds is responsible for keeping many breeds from being lost. The Leicester Longwool Sheep Breeder's Association has been formed and we are in the process of setting up a registry. I fully believe that at some point commercial producers will once again turn to the Leicester Longwool, as has happened numerous times in the past two hundred years. This is why the ALBC and its members must continue their very important work. The staff at Colonial Williamsburg feel fortunate to have played an important part in the conservation of the Leicester Longwool sheep." The Leicester Longwool is one of the sheep breeds listed by the American Livestock Breeds Conservancy as critically endangered. Breeds considered critical have fewer than 200 North American annual registrations and an estimated global population of less than 2,000. Leicester Longwool Sheep Breeders Association , Elaine Shirley, The Colonial Williamsburg Foundation, Coach and Livestock Department, P.O. Box 1776, Williamsburg, Virginia 23187-1776. Photographs: Leicester Longwool Sheep Breeders Association, Elaine Shirley, The Colonial Williamsburg Foundation, Coach and Livestock Department, P.O. Box 1776, Williamsburg, Virginia 23187-1776.